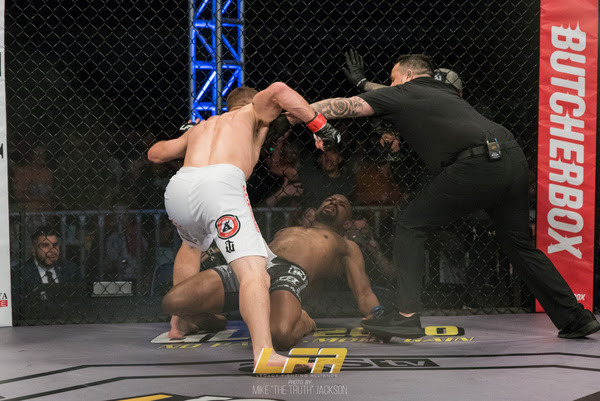 Here are the main card results from LFA 63, which saw Derrick Krantz knockout Justin Patterson in the opening round. With the win, the 31-year-old Krantz moved his record to 22-10. LFA 63 took place in Belton, Texas. Main Event – Welterweight Fight – Derrick Krantz (24-10) knocked out Justin Patterson (11-5) at 2:27 in round one. Co-Main Event – Featherweight Fight – Gabriel Silva (7-0) knocked out Jake Heffernan (7-1) at 1:23 in round one. Flyweight Fight – Hailey Cowan (3-1) submitted Sarah Click (2-3) with a rear naked choke to win by technical submission at 1:29 in round two. Featherweight Fight – Rafael Barbosa (11-1) defeated Cameron Graves (7-3) via unanimous decision (29-28, 29-28, 29-28). Bantamweight Fight – Armando Villarreal (5-1) knocked out Devin Miller (5-2) with strikes at 0:16 in round three. Middleweight Fight – Kailan Hill (4-0, 1 NC) defeated Jhonoven Pati (4-3) via unanimous Decision (30-27, 29-27, 30-27).